New Blog Post ➡ #FREE #KINDLE #BOOK ➡ Tweedledum and Tweedledee, FREE!! "...A must read for mystery lovers." In the middle of the night, Alberto Alonzo sneaks out to play at the casino with his mother's credit card in his hand. The next morning he is gone, and no one knows where he is and, for his family, a real-life nightmare unfolds. Emma Frost is with her family on a cruise in the Mediterranean Sea when the boy goes missing from the ship. The boy is the son of a world-famous race driver. When the wife is killed shortly after that, everyone turns their attention to the race driver and thinks he killed them both. But soon, another teenager disappears in the middle of the night, and Emma suddenly finds herself leading a desperate manhunt to track down the killer before he strikes again. 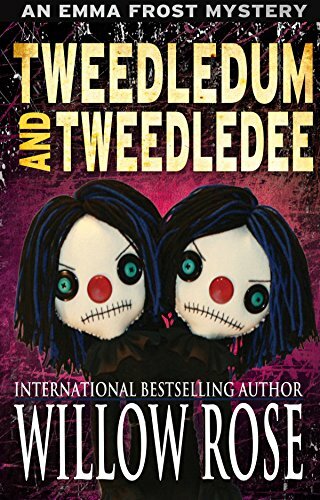 - Tweedledum and Tweedledee is a spine-chilling mystery. It is the sixth book in Willow Rose's bestselling Emma Frost series.